Congress MLA Randeep Surjewala quoted BJP leader Kalraj Mishra as saying that he would 'shoot the troublemakers' who were raising slogans at a rally. 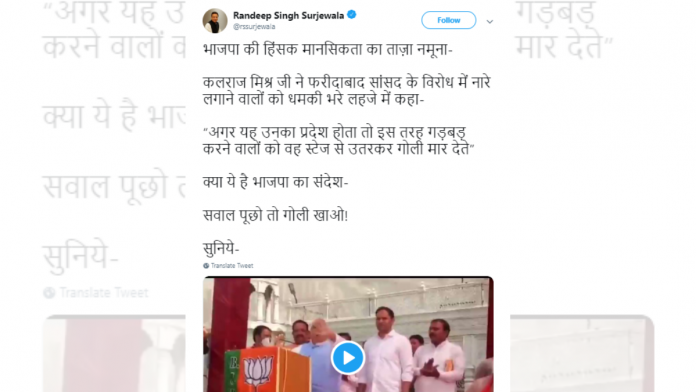 New Delhi: Congress MLA Randeep Surjewala posted a video on Twitter and wrongly quoted BJP leader Kalraj Mishra to take a jibe at the saffron party’s “violent mentality”. Surjewala posted the video in which Mishra was seen addressing a rally in Faridabad on Sunday. Surjewala quoted Mishra as saying, “You are ruining Modi’s reputation. If it was my state, I would’ve got down from the stage and shot the troublemakers”. The “troublemakers” Mishra was referring to were those raising slogans at the rally against BJP’s Faridabad MP Krishan Pal Gurjar. Mishra, who is the BJP’s in-charge in Haryana for Lok Sabha elections, was campaigning for Gurjar Sunday. सवाल पूछो तो गोली खाओ! The post has over 2,400 retweets and 6,400 likes. Based on Surjewala’s video, some media organisations wrote about Mishra’s “shocking” remarks, and even quoted him. But, later Mishra shared a video in which it could be clearly heard what he had actually said — “If this was my state, I would have got down from the stage and spoken to the workers”. “Surjewala ji, stop fooling the public and play the role of a responsible citizen”, he tweeted. Mishra was speaking at one of the many ‘Vijay Sankalp’ rallies organised by the BJP as part of its Lok Sabha election campaign. However, much to the party’s embarrassment, some BJP workers began protesting at the rally against MP Gurjar, demanding that he should not be given a ticket from the seat again.